There's a funny story how I came to find this tobacco, which I'll save for when we finally meet. I was surprised to see how black the tobacco is. I feels moist, but it lit easily. Lots and lots of smoke...I smoke mostly in the evening on the patio in the moonlight, so I enjoy a tobacco that gives plenty of visible smoke...the problem normally is that along with lots of smoke you get an ashy taste. NOT with Sam's blend. 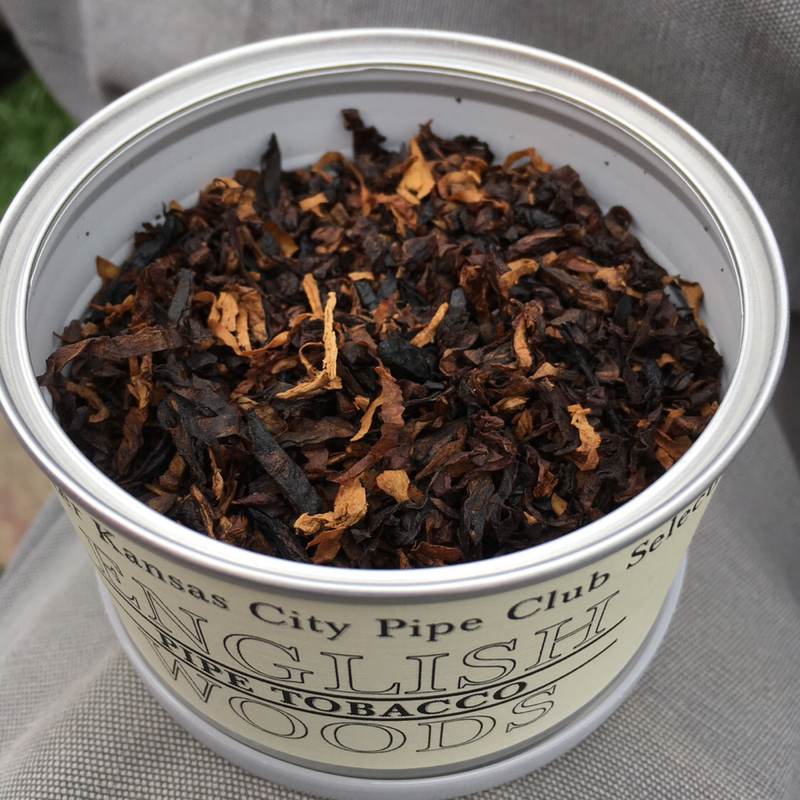 It is a mild English and no ashyness. You need to sit and contemplate this one, its tastes are subtle and to delv into them, you need to be in tune with the the peace of a quiet smoke. It would also make a great fishing/working in the yard/bird hunting... smoke...it smoked easy and well and stayed lit through the bowl...no muss no fuss. 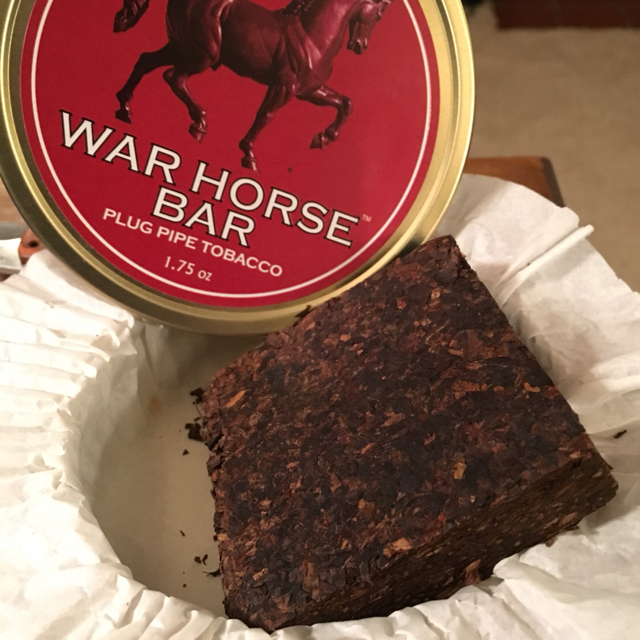 A good find in the tobacco world. Thanks again Sneaky Secret Santa. A 50 gram tin of McClelland - Pebblecut (Ashton Revival). Wonderful stuff and with hardly any of the McVinegar tin note. I have noticed in the last year that Sam's Blend has gone away in the 8 oz. tins. Worried this would become a has-been blend for C&D as they experiment and keep coming out with more and more new tobaccos, I sent them an email to voice my concerns. The master blender sent me a personal email reply to ensure me Sam's Blend would remain on their production list but it wasn't a strong enough seller to warrant the 8 oz. size anymore. Makes me sad I never snatched one up while I had the chance. Just opened a tin of Kendal Cream deluxe flake. It’s my first time with this. I was expecting more Burley, this seems to be mostly VA. Smells fantastic out of the tin; we shall see. I view you as a man of style and Grace. You'll like it. Heh, updating my resume now. I had a law clerk who had "International Man of Mystery" listed under hobbies. I liked him before he ever got into the room. How was the Kendal Cream? Delicious, right? Actually, yes. I enjoyed it enough to sneak in a couple of bowls yesterday. So far so good. A tin of Celtic Mist. I just opened a nine year old jar of McCl #5115 Old World Classic Cake. Having not touched this stuff in a long time I just opened one of a few 2 year old 1/2 pint jars of 5115 I have and all I can say is wow. Maybe my palate has changed over time, but this blend now tastes sublime. Many thanks again to Rusty for 1st telling me about McClelland Virginias. Note the unique sheet of clear plastic over the tobacco. Ritzy. I am presently smoking a large bowl fresh out of the tin and it is a little Meh. But Russ Oulette himself told me tinned Virginias need to be decanted to become sublime. So, I'll loosen the compacted tobacco in the tin up and put it in a 1/2 pint Kerr jar so it can get aired out for some days. Don't see any MClelland like broad ribbon Red in the mixture but maybe they cut it special for Russ because he wanted an easy burn shag cut, which it is. Cracked my first tin last evening. It is stamped 2018 so there wasn't much fermentation going on. The tin reads it's a tobacco for a special occasion, but I say it makes any occasion special. It's that good. Just opened a tin of Gawith Hoggarth Mahogany. I ordered it along with Germain's Rich Dark Flake from across the pond. The Mahogany reviews I've read, have not been great, but I must say I like it. An almost stringy broken flake that rubs out easily and burns slowly, it's mildly flavored with an almond-like Lakeland essence. Rich, ripe red virginias are combined with top grade Izmir leaf, pressed and aged in cakes, then sliced into flakes and tinned. Goose55 wrote: Rich, ripe red virginias are combined with top grade Izmir leaf, pressed and aged in cakes, then sliced into flakes and tinned. Finally opening this little gem from my CPS SS. Tin note is of a VA forward English. First bowl is burning now. Excellent first impression.